Spring is only a few weeks away, but it really felt like it arrived today. The weather was beautiful, sunny and even a little warm. A lot more people were out walking and riding their bikes because it was just the perfect day for a stroll. When I walked out of church this morning I looked up at the bare trees against the blue sky and loved just the contrast of the light and dark branches. 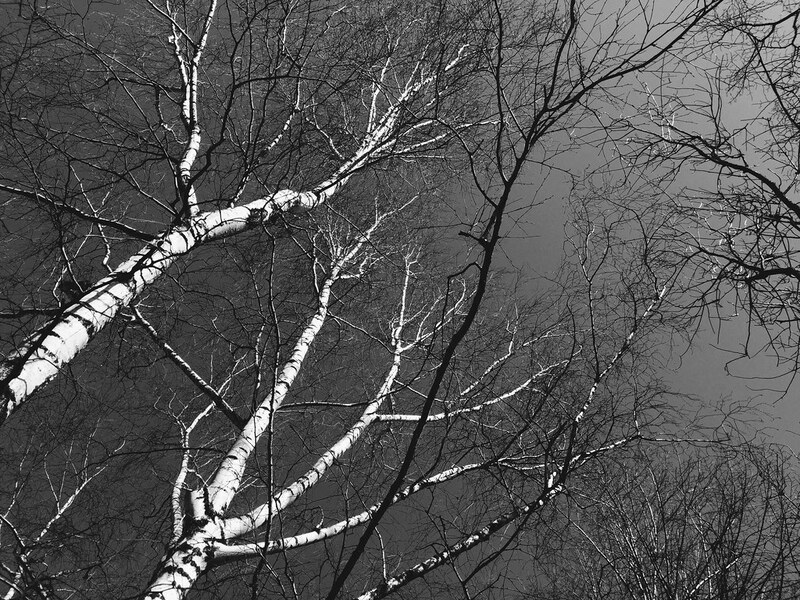 I converted the above photo to black and white to really bring out that contrast and I know soon those trees will begin to bud and fill up all that empty space. I continue to feel my strength and health returning and even though I’m not 100%, the whole family was able to make it to church this morning. We ended up staying with the kids in their respective classes again, which is always fun. Whether we’re in the main service or the kids class it’s a Czech language lesson, so that’s helpful! Right at the beginning of Titus’ class all four of us (that is, me, Bethany, Titus, and Avery) were together in Titus’ classroom and the kids were singing Czech Bible songs. We could understand that melody to the song “Read Your Bible Pray Every Day” and Bethany was singing in English to Titus while the rest of the class sang in Czech. When they finished they asked Bethany to lead everyone in the English version of the song which she did, and I could see one little Czech knew most of the English words! It was a sweet little moment and it’s always nice to do even just a little song in English. After church we had lunch and had to run a few errands. We needed a few things from the electronics store and then some small things from IKEA so we took a little trip out of town. Next to IKEA is a mall with a huge 2-story slide which we’ve talked about before and the kids asked if we could go there so we did. The kids had a blast climbing up the big tower and heading down the slide (they must’ve done it fifteen times!). I got the blast of photos that you see above and you could hear them laughing from a mile away. It’s really fun to watch them play together and laugh. Tonight we have mostly just been picking up the house and getting ready for the upcoming week. One of the things we picked up at IKEA is a new clock for our living room and I’ve been trying to figure out how to drill into our concrete walls to hang it. Our friend Greg is going to come over tomorrow afternoon to help me so hopefully I can get a photo of that when it’s up. Other than that, it’s just been a great Sunday and I’m thankful to get back into the swing of things, including language lessons tomorrow!